Do you have sensitive skin that you are afraid to expose to the sharpness of an electric razor? Is every day shaving a painful experience for you? If yes, you haven’t tried the Philips S7530/50 Series 7000 Electric Shaver with Beard Trimmer and Cleaning Brush. Designed exclusively for men with sensitive skin, this electric shaver comes with a beard trimmer and cleaning brush to make shaving an effortless process for you. Now, you don’t have to be scared about skin rashes, redness and other problems, as you can enjoy silky-smooth shaves every day thanks to this excellent grooming tool from one of the world’s most trusted brands, Philips. Look at our electric shaver with beard trimmer review to see all the features, pros and cons of this product to understand more about its functionality.. The Philips S7530/50 Series 7000 Electric Shaver for Sensitive Skin is all that you ever dreamed of in your electric shaver and more. It is comfortable to hold and use and ensures you get clean & smooth shaves every day, without having to try too hard. Here is a look at the excellent features of this shaver. Comes with a Smart Click Beard Trimmer with five different length adjustments from .5mm to 5mm. This allows you to go with stubble to short beard looks. Protection cap to help make sure the heads do not get hurt when not in use. On Philips site, some reviewers with dense beards say it’s one of the best shavers they have every used. You could buy other accessories other accessories which would work with the Philips SmartClick on the shaver. The cleaning brush is recommended to be changed every six months, and the heads every 2 years. So, the cost of maintaining this shaver is going to be an ongoing expense. Some reviewers feel it doesn’t live up to Philips previous quality standards. If you are looking for a smooth and effective shave for your sensitive skin, the Philips S7530/50 Series 7000 Electric Shaver with Beard Trimmer is the right model for you. 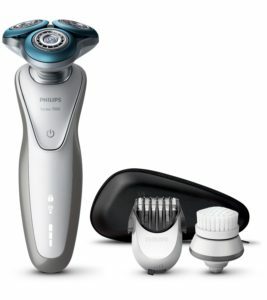 The S7530 has not been on the market very long to have a lot of reviews online and most them are positive, but with Philips you can rely on them for a solid shaver. It is currently selling for around £130.